There's no denying that China doesn't have the best record when it comes to urban planning and development, particularly in regards to real estate—and their most recent blunder is a doozy. 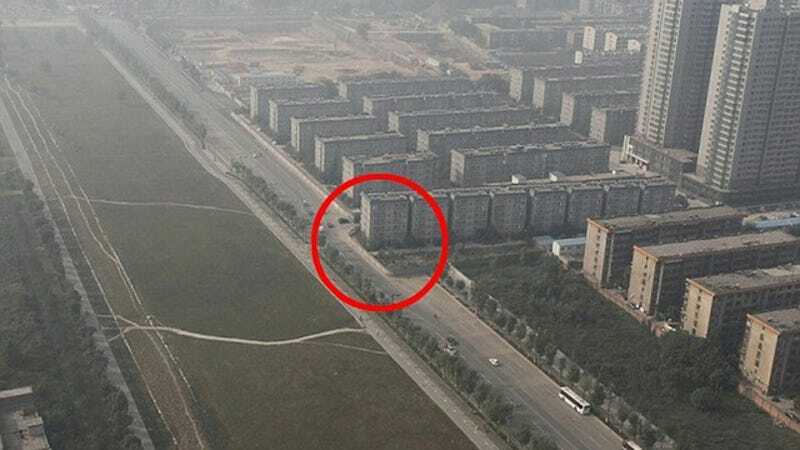 Thanks to some poor planning and (presumably poor) communication, China accidentally built a brand new set of modern apartments right in the middle of an eight-lane highway. Your very own permanent, honking sound soother. The whole thing started when a block of residents in Xi'an, Shaanxi province in western China were uprooted to make room for a soon-to-be-constructed public park. In exchange for the inconvenience, tenants were promised a brand new, block of modern apartments—it's just too bad city planners forgot about that little eight-lane superhighway they were going to build in the exact same place. Whoops. The previously-relocated residents got a few months of peace and quiet in their new homes before the council came a-knockin' and politely asked if they would move out of their brand new homes, please. As you can imagine, these involuntary nomads weren't happy. Plus, after all that park and highway and fancy apartment construction, council funds were running low. And since it could barely offer any reasonable amount of compensation, the tenants refused to accept what little it did. We don't exactly like being stuck out in the middle of a 60metre-wide highway, but you get used to it. If they make a decent offer most would move, but it's hard as it seems we had only settled here when we were asked to move.